Home > Product Management Resources > What is Product Management? > Documents and Templates > What is a Marketing Plan Template? Marketing plans are the ongoing version of the product launch plan — often with less time urgency because the “new” product is finished and released for sale. However, your company has to continue generating market excitement and awareness for your products. 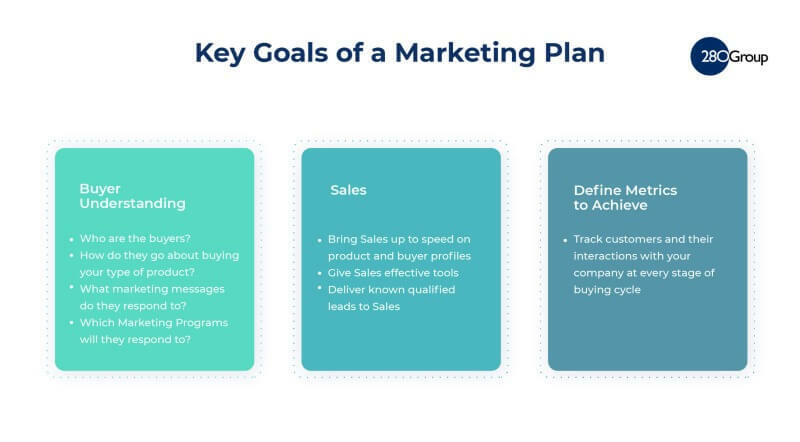 The goal of a marketing plan is to create and maintain a high level of interest in your product, which leads to meeting your sales and profit goals. A great marketing plan considers the customer’s decision-making process and also outlines what the most effective communication method or methods are at each particular point in the journey toward buying. Each exposure a customer has to your message is called a touchpoint. For example, seeing an ad is a touchpoint. A good rule of thumb is to assume a customer needs at least seven touchpoints to become interested and ultimately decide to purchase your product. That’s a lot of times that marketing or sales efforts directly reach your customer. Executive summary: A summary covering the market situation, key objectives, key strategies, and approaches to addressing marketing objectives. What are the risks and the return on investment, and what is marketing’s recommendation? Remember that the executive summary is written once all other parts are completed. Situational analysis: What is the market landscape? What happened in the past? What is the current opportunity and what marketing resources (money, people) are available? Marketing objectives and strategy: What are overall marketing objectives (and product specific ones, if necessary) and key marketing strategies? Which markets does the company or division plan to target? Does marketing need to take any other considerations into account? Product specific information in this section should come from the market strategy and possibly the market needs documents. Program mix: In this section, marketing defines all your marketing mix components. Branding and messaging: How will marketing support your brand? Advertising: Document any and all advertising including online ad plans here. Social media plan: What social media outlets is marketing planning to use? Public relations: What are the public relations strategies? Direct mail/email: What are the direct mail and email plans? Does the marketing plan call for sending out a regular newsletter or buy-in lists of potential new customers from list vendors? What activities will marketing undertake to grow email lists? Trade shows and events: What events does marketing plan to support and how? Will your company be there, or will marketing, Product Management and sales support a partner’s efforts? What are specific goals and objectives for each event? Channel: What are sales and marketing’s plans for working with the channel? If marketing funds are set aside as a percentage of sales, what is the best use of that money? Timelines: What happens when? Activities should be spread out so that there is a regular cadence of marketing activity over time. Deliverables: What are the key deliverables? Videos? Collateral pieces? A new website? Budget and return on investment (ROI): What is the budget for marketing activities over a certain period? As a result of all these activities, what is the expected ROI? Governance: Who are the core marketing team members? Who needs to approve this document? Risks, assumptions, open issues, exhibits, and appendices: As with all documents, note the risks, assumptions and open issues and provide appropriate exhibits and appendices. What are the marketing objectives and strategy? Does it support what you need it to in order to make the product succeed? The marketing plan may detail activities that support an overall revenue number. Does it align with what your forecast and expectations are? What is the mix of marketing programs? Make sure you understand how the choice of marketing activities helps or hurts your product’s overall success. Is there enough online advertising? Not enough focus on public relations or getting good reviews? Make sure the mix supports getting enough touchpoints to the market you’re targeting. Customers go through a process before they purchase. This is called the sales funnel. At each stage of the sales funnel some customers proceed and others drop out. Plan marketing activities for each stage of the sales funnel for your best chance of success. Here are some examples of goals that you can set for each stage. Awareness: How many people will be exposed to the product, and how many touchpoints do they need before they take action? Interest: Online search is the way most people investigate their options. Even if they don’t know your brand or product, you’re likely to have customers come looking if you know their likely search terms and are in the top three options that show up. Make sure that the few words that they see in the search engine results (or advertisements delivered through Google AdWords) deliver a short, compelling message that convinces them to click through. Rely on marketing’s expertise to work through the search terms and compelling messages. Evaluation: The evaluation goal you set depends on your product. For example, software companies can simply allow customers to sign up and try it for 30 days. Make sure that your marketing has a compelling call to action such as “Buy Now.” Really. Don’t forget to ask the customer to buy. Commitment: When people evaluate products, and have a positive experience, they become increasingly likely to buy. Make the final buying process as easy as possible. Plan marketing activities to support your marketing plan goal and you’re more likely to succeed.